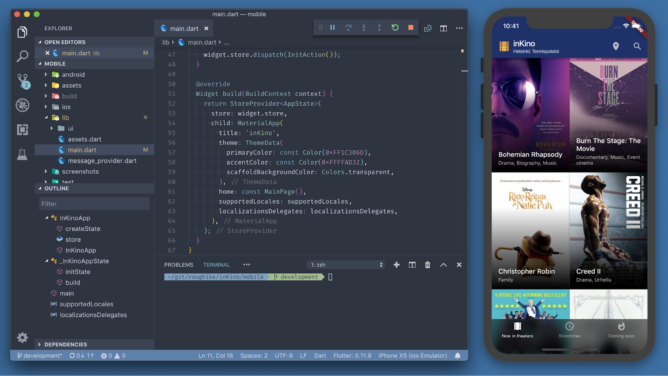 Yesterday, at a dev-focused event at the Science Museum in London, UK, Google announced the 1.0 release of its cross-platform portable UI toolkit. Flutter has been in development since in 2015 with several betas being going out in the last year and a preview release this summer. It will allow developers to build apps that seamlessly work on both Android and iOS without maintaining separate codebases. Google designed Flutter to enable rapid development and effortless collaboration between designers and coders. It includes Material Design widgets that look great on Android devices and iPhones alike, and it's all powered by Google's own Dart platform. The stateful hot reload feature allows for instant visual results without restarts, saving plenty of time and increasing productivity. Flutter is also open source, with contributions from devs all over the world meaning tons of plug-ins are already available to try out. At yesterday's Flutter Live 2018 event, Product Manager Tim Sneath and a host of guests and other Googlers took to the stage to introduce Flutter 1.0 to a crowd of enthusiastic devs — you can watch the recap below. The versatility and speed of Flutter were shown off, as well as parallel products such as the Hummingbird web implementation, native vector animation tool Flare from 2Dimensions, and much more. Take a look at Google's full blog post to learn more about Flutter and all of the exciting new tools that go along with it.